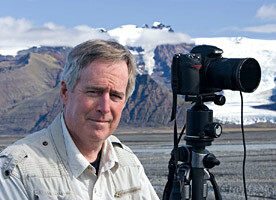 Bob Peavy is pursuing a life-long passion in photography. A resident of Maryland (near Washington, D.C), Bob has "seen" through a camera lens since childhood when he was first introduced to the magic of his father's darkroom. In the 1990's, Bob undertook more structured studies of the craft of photography and visual design. He has taken courses and attended workshops in Canada, the District of Columbia, Maryland, North Carolina, Virginia and West Virginia. Among the noted photographers with whom he has studied are Jim Clark, Andre Gallant, Bill Lane, Arthur Morris and Freeman Patterson. Bob has moved from the traditional chemical darkroom to the "digital" computer workspace. He continues to study computer-age processes and techniques under Eliot Cohen, a Washington area photographer and digital teaching icon. And, Bob is blessed with a most patient mentor, Lou Stovall, a widely known artist and master printmaker. Bob served for two years as president of the North Bethesda Camera Club, a 140-member Maryland club that is well regarded for its members' work. In 2002, the Club received top honors for its entry in the Nature's Best International Photography Competition, to which Bob contributed. He has received individual awards in other competitions and juried exhibits. His work is held in private collections in many states.